China is shaping the future of technology in significant ways. These shifts will mark global trends for the next two decades, and beyond. In this report, we take a closer look at the drivers behind China’s technological progress and how the travel industry will need to evolve to support the needs of Chinese consumers for simple and seamless transactions. We’ll also look at how China’s One Belt, One Road initiative will shape travel across continents, and encourage more Chinese travellers to see the world. Chinese consumers are already accustomed to a broad range of mobile technologies, which are only beginning to take hold in other countries. What makes these digital tools useful in China will also make them attractive around the world. China leads the world in e-commerce and is expected to exceed $1.132 trillion in sales this year. That is nearly half of worldwide e-commerce sales, according to eMarketer. What is more, 75% of China’s e-commerce sales will be transacted on mobile devices. This volume of digital commerce far exceeds that in the US ($450.81 billion), UK ($110.07 billion) and Japan ($95.33 billion). — eMarketer senior forecasting analyst, Oscar Orozco. China also leads the world in applications to support online shopping, including convenient mobile payments like Alipay and WeChat Pay. Chinese consumers are accustomed to browsing, and purchasing with a few quick taps of their smartphone screens. They are also engaged in the shopping process, as active reviewers and sharers. Following a 2016 survey, McKinsey reported that half of the Chinese digital consumers they interviewed use social media for product research or to get recommendations. The survey also found that 31% initiated their purchases using links promoted in the social media platforms. The significant value of Chinese e-commerce transactions fosters ingenuity among competing players, who ensure digital transactions are simple and secure. Chinese start-ups in particular are actively engaged in solving tomorrow’s lifestyle needs today. This includes the development of advanced AIs, service robots, drones, sharing-economy services, and even literal power sharing, with power rental banks keeping mobile devices charged. In its eCommerce in China report, PwC higlights several trends that are shaping the retail and consumer products sector. These may also influence travel marketing and retail strategies in China and beyond. Interestingly, the value placed on these factors globally are lower across the board, except for pricing which is weighted slightly higher at 57%. Customer reviews are of significantly lower importance globally, at only 15%. 76% of Chinese consumers say knowledgeable sales staff are important, or very important. 70% of Chinese consumers say that real-time personalized offers, tailored to their needs are important or very important. 62% say self-service checkout is important or very important. Online brands are finding ways to satisfy this desire for personalization through applied data analytics and innovative services. Some of the features consumers value in brick-and-mortar retail can also be adapted to online and mobile shopping, particularly in a travel context. For example, while a brick and mortar travel agency may be able to offer personalized service, new travel technology trends focus on tailored offers. Digital platforms can be enriched with a greater variety of content which might help consumers visualize and anticipate their travel experience, including with multi-media. Interactive visual media can go beyond what paper catalogues might offer. And the digital shop is open 24 hours a day, every day of the week, giving consumers time to ponder a high involvement purchase like travel. Additionally, with social media contacts and consumer reviews, travel companies can also offer greater context to the travel planning process. The majority of Chinese consumers (68%) value seeing an extended range of products, and 63% value an inviting ambiance. Digital platforms with a content-rich interface, which make browsing a large range of offerings easy, and completing the purchase seamless, may appeal to these same consumers. Alibaba’s Tmall, for example, is actively used by 97% of Chinese online shoppers. It combines advanced search capabilities with content to help consumers evaluate goods, whilst enabling each “store” to maintain unique branding. The efficiency and simplicity of its shopping process adds value. The prosperity brought about by China’s rise as a technology economy has also helped fuel a new era of wanderlust, with Chinese consumers travelling both at home and broad, and placing great importance on travel as part of a balanced life experience. China is rising to dominate air travel markets. By 2024, IATA expects that China will have overtaken the US as the world’s largest aviation market (defined by traffic to, from and within the country). By 2035, annual passenger numbers in China will reach 1.3 billion. Routes to, from and within the Asia-Pacific region will grow by 1.8 billion annual passengers by 2035, for an overall market size of 3.1 billion. By comparison, IATA expects the North American region will serve 1.3 billion annual passengers by 2035, and Europe will serve 1.5 billion passengers per years. Chinese travel has already grown dramatically, with 37 million more passenger journeys in 2016 compared to 2015. That growth, according to IATA statistics, was more than the next two largest domestic markets—the US and India—combined. Similarly, in its 20-year forecast, Airbus reports that international travel to and from China has more than doubled over the past ten years. Airbus also expects this trend to continue - forecasting that the outbound China market will double to over 200 million travellers per year by 2020. Chinese policy initiatives have focused on fostering international commerce, and are already influencing travel markets and driving travel growth in China. This not only sustains domestic and international tourism, but is particularly important for airlines eager to attract high-revenue business flyers. The core policy behind this is China’s One Belt, One Road policy, which has lead to investment in transport infrastructure on the ground and in the air. It also encourages trade, investment, and travel well beyond China’s borders. China established a $40 billion Silk Road Fund in 2014 to fund One Belt One Road initiatives, but this investment was just a start along the path of development. There are ongoing additional investments by government and industry to build transport infrastructure and technology which will deliver new strengths and new partnerships along the way. China’s technological development is not limited to mobile applications. Transport capabilities, which position China to compete globally, are also a focus. This May, Chinese aircraft manufacturer Commercial Aircraft Corporation of China (COMAC) completed the successful first flight of its C919 narrow-body aircraft. Reflecting its confidence in the performance of the plane, COMAC took an unprecedented decision to transmit images of the first flight directly from the cockpit. This critical milestone was tracked by industry watchers around the world. The C919 aircraft is expected to support growing demand for interconnectivity in China on short and medium haul routes, though it also represents competition for the Airbus A320 and Boeing NextGen 737, with similar range and capacity. As of September, 2017 COMAC had reported 750 orders for the C919. It is likely all three airframe manufacturers will supply the 3,200 aircraft that China will need over the next ten years, according figures from aircraft lessors Avolon, Ireland. COMAC also unveiled plans for its long-haul C929 aircraft during the Paris Air Show this June. In addition to developments in air transport, the One Belt, One Road initiative includes advancements in high-speed rail. The bullet train service, travelling at speeds of at 350 kph, is expected to cover 30,000 km by 2020. While Silicon Valley dreams of commute by Hyperloop, the China Aerospace Science and Industry Corporation (CASIC) has begun researching a “high-speed flying train”, which will beat plane travel by reaching three times the speed of sound (1,225 km/h). China is itself a popular destination, and Chinese citizens are eager to travel the world. Some destinations are gaining popularity because of the One Belt, One Road initiative, and others are fostered by the new Open Skies agreements. As Airbus reports in its 20 year forecast, a new Open Skies agreement between Australia and China is helping to boost tourism to Australia. Chinese travellers are Australia’s fastest growing and most income generating demographic. More than one million Chinese tourists travelled to Australia between 2015-16, which is an increase of 22.3% over the 2014-2016 period. They spent almost US$7 billion while there. Since the forging of Open Skies between the countries, the number of airport pairs connecting the two countries has doubled. Boeing reports double-digit growth over the past ten years on routes between Africa and China, integral to the Silk Road. Skyscanner Travel Insight data evaluates the fastest growing destinations in China. The data reflects strong domestic, and Asia-Pacific growth, projected by airline industry analysts. The fastest growing destinations also span locations along the new Silk Road. For example, while the fastest growing destinations out of Shanghai International Airport include domestic Dayong Airport, as well as Asia-Pacific destinations in Japan, Malaysia, Thailand, South Korea, and Vietnam; with Vladivostok International Airport in Russia ranking second after Dayong in rapid growth. High growth destinations also extend onwards to Europe, with both Prague in the Czech Republic and Vienna in Austria among the top 10. The most popular O&Ds out of Shanghai parallel the fastest growing routes, with concentrations in Asia-Pacific, and Tokyo proving particularly attractive, but they also extend to Europe and to the Americas. Similar destination preference patterns emerge for travel originating in Beijing. Both Chinese and international airlines are actively shaping their strategies around growth in Asia Pacific - and China in particular. European carriers KLM and Finnair are making their presence known on technology platforms which are familiar to this huge customer base. These include offering customer service on WeChat, and even WeChat payment options. Airports vying to develop city-pairs in China are introducing wayfinding technology to help Chinese consumers navigate airports in Mandarin, and even welcoming AliPay payments at airport shops. 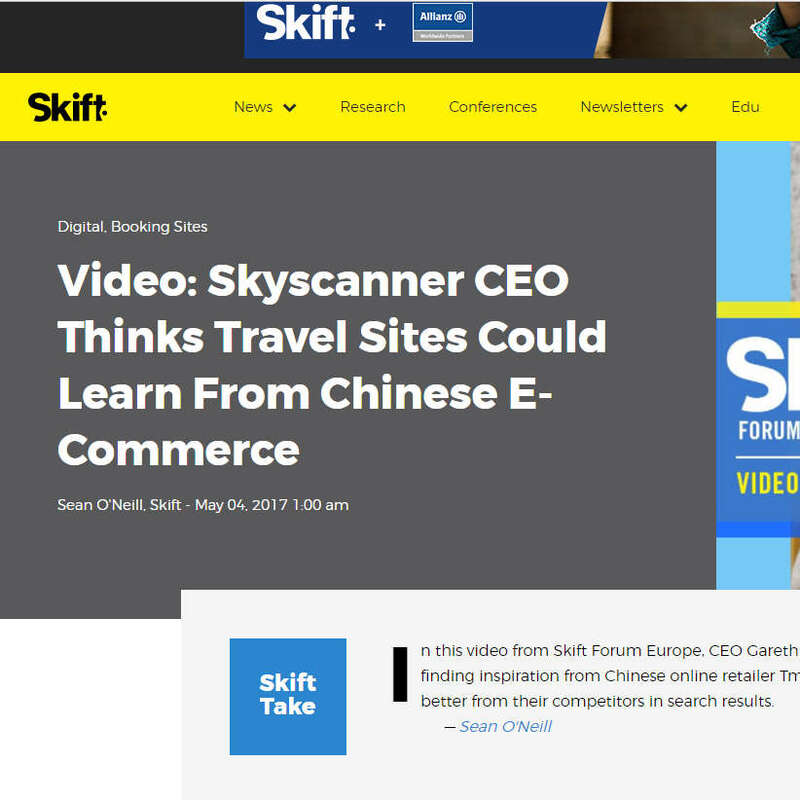 Any travel company which wants to grow along with what will be the world’s dominant travel market will need to think differently - especially when it comes to technology, and understanding how Chinese consumers search, shop and pay.